An island bristling with the world's rockets, Spaceport Alpha is home to the new "International Spaceflight Museum", a virtual world education site dedicated to the Space Age and beyond. While starships abound in SL, what's uniquely cool about the island and the museum is that they're a labor of love for several Residents with genuine backgrounds in aerospace-- it's financed and developed by current and past alumni of the Johnson Space Center, Boeing's space station program, the European Space Agency and the UK's National Physics Lab, the aerospace museum at Cape Canaveral, and Northrop Grumman Space Technology. So while the rockets are simulated, the wisdom behind them is real. Spaceflight Alpha is open for public exploration this Sunday-- details for its premiere here. That reminds me of the Air and Space museum I visited in the U.S. one time. Huge old decomissioned rockets everywhere. 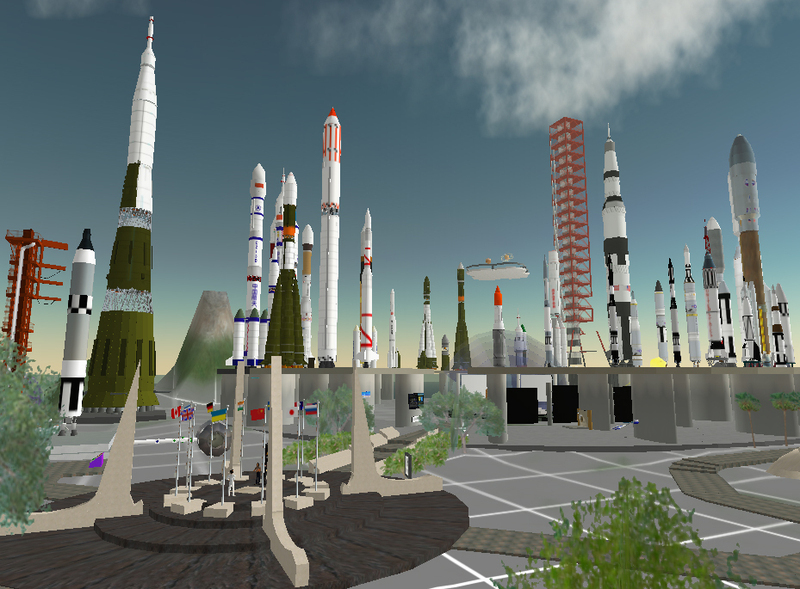 I'd like to add that the International Spaceflight Museum has contributions from a huge variety of SL residents... many with no formal background in aerospace, but with a lot of enthusiasm for spaceflight and dedication to making a truly great museum. This is a great effort and I cannot wait to browse through the exhibit. Well done! !